I'll show you the images of my table. Happy 75th Birthday to Fiesta® ! Seventy-five years ago the world faced many of the same challenges that confront us today. Slow recovery from the Great Depression, political upheavals around the world, and natural catastrophes dominated the headlines. More positive highlights in 1936 included the completion of Hoover Dam, the publication of Gone With The Wind, the opening of the San Francisco-Oakland Bay Bridge, the debut of The Green Hornet on the radio, and the publication of the first issue of Life magazine. One of the events of 1936 that wasn't front page news still holds the interest of collectors seventy-five years later. 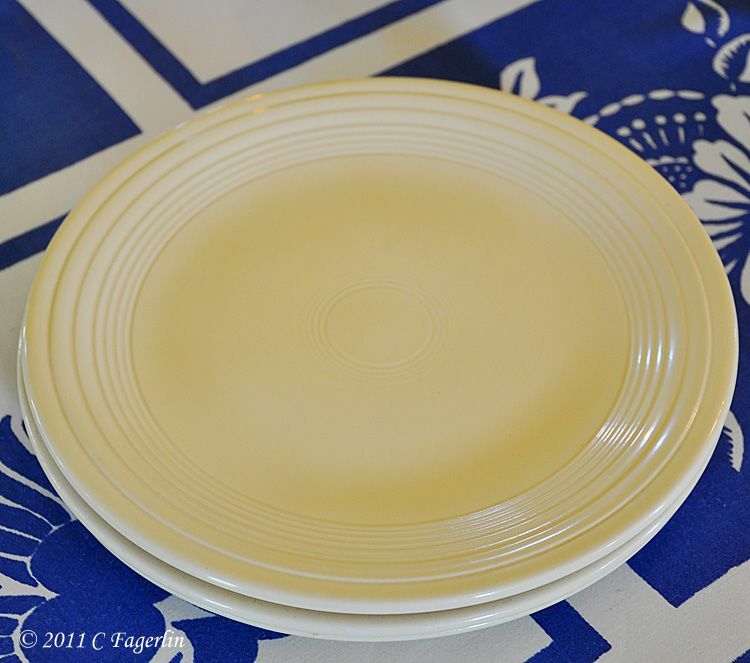 A widely circulated women's magazine Delineator, Frederick Hurten Rhead's well received Fiesta® designs, and an up and coming photographer named Margaret Burke-White all came together in 1936 to create an early entry in the history of Fiesta® dinnerware. 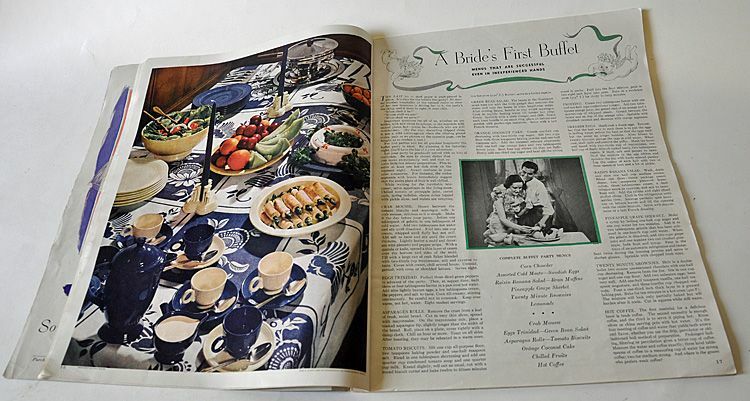 A one page spread about buffet party recipes in the popular women's magazine, tucked between an article on the secrets to making rose petal jam and another detailing the qualities required in a “good husband,” would most likely have been forgotten over time had it not been accompanied by a photograph of a Fiesta® laden buffet table on the facing page. Entitled A Bride's First Buffet, the article contains a dozen or so recipes designed to make for a stress free entertaining opportunity for a young bride and groom or “old-marrieds.” Tips for this Saturday evening soirée include having the new groom pitch in to help with “the fun of a joint adventure.” It is difficult if not impossible for an avid collector to concentrate on the tasty recipes and tips, with the image of vintage Cobalt Blue and Ivory Fiesta® covering a buffet table in the photograph that accompanies the article. Once it was discovered by collectors, the article became highly sought after as an addition to vintage Fiesta® collections. Other than company brochures and trade publication advertisements created by the Homer Laughlin China Company, the article is thought to be the first appearance of Fiesta® in print media. 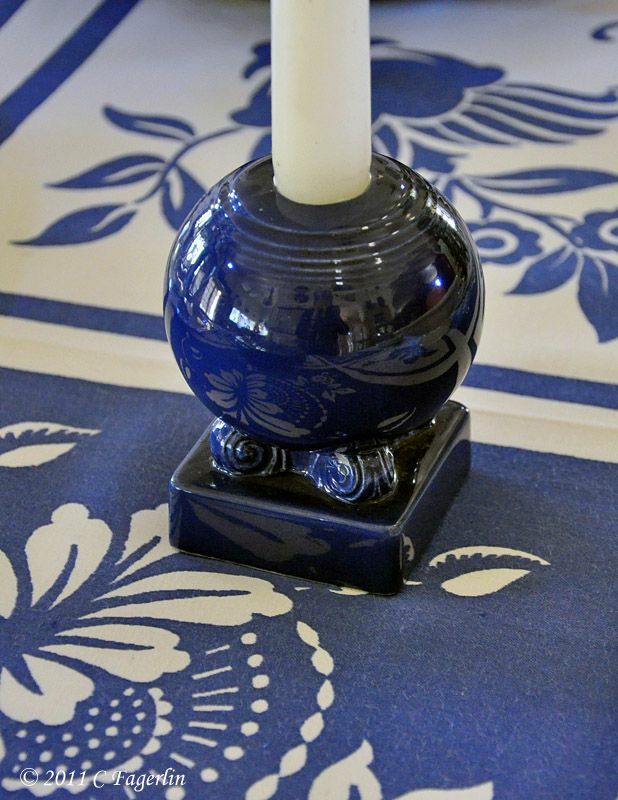 Fiesta® was designed by Frederick Hurten Rhead, with the development of glazes and designs beginning in late 1934. Rhead appears to have been a savvy businessman as well as a talented potter. He intended to take advantage of the wide public acceptance of brightly colored dinnerware, which began in California several years earlier. Actual production of Fiesta® began in late 1935 to be ready for its introduction and delivery to retail locations in early 1936. Fiesta® was introduced to the public at The Associated Glass and Pottery Manufacturers exhibit in Pittsburgh in January 1936, just months prior to the publication of the article in Delineator. Fiesta® items produced in those early months somehow reached the staff of Delineator and for collectors of Fiesta® they became the stars of the now famous photograph. The article was originally published in the June1936 issue of Delineator magazine, which was fast approaching its demise after six decades as a highly successful women's magazine. The Delineator - A Journal of Fashion, Culture, and Fine Arts was first published in1873. It was the flagship fashion magazine for the Butterick Publishing Company, which used the magazine to promote Ebenezer Butterick’s new sewing patterns. 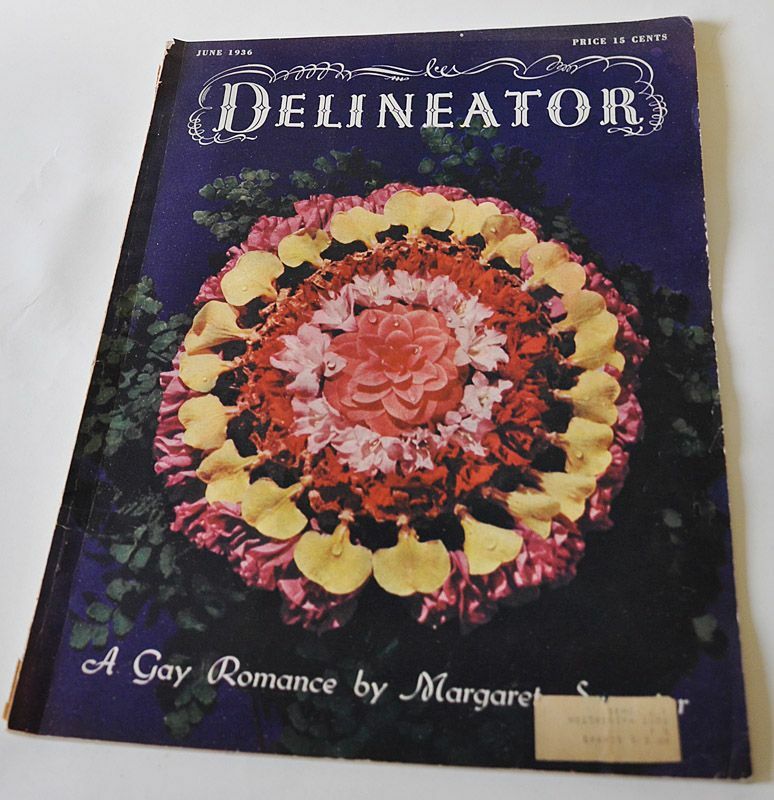 During the economic downturn of the late 1920s, the publication absorbed another Butterick publication The Designer and its name was changed to simply Delineator. In April 1937 publication suddenly ceased. The operation was sold to the Hearst Corporation, which subsequently merged the publication with Pictorial Review (1899-1939). The passage of so much time, makes it difficult to state definitively how the article and photograph came to be published, but important clues to the backstory can be found. The attribution below the image fills in two important pieces of the puzzle. The tablecloth and accessories were supplied by Bloomingdale Bros and the photograph was attributed to Margaret Bouke-White. Joseph and Lyman Bloomingdale opened their first shop in 1872 and initially they only sold hoop skirts, a major fashion statement of the time. Most retailers specialized in just one type of merchandise, but the Bloomingdale brothers soon pioneered what became the “department store.” Bloomingdale's joined the Federated Department Stores, Inc. as the nation headed into the Great Depression. 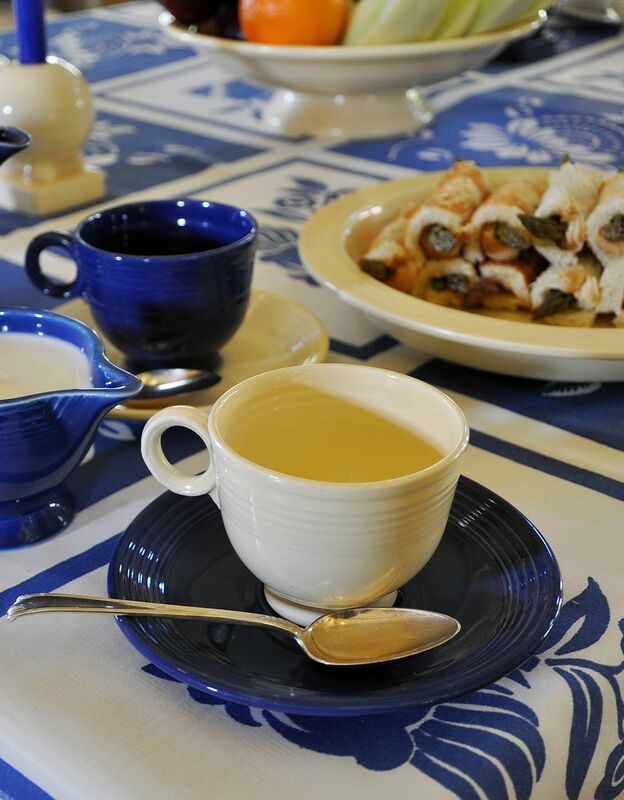 In 1936 they would have been a great source for beautiful housewares including table linens and the recently introduced Fiesta® dinnerware from the Homer Laughlin China Company. Margaret Bourke-White was the woman behind the image in the Delineator. She was born in The Bronx, New York on June 14, 1904 and died in Connecticut on August 27, 1971. She was an acclaimed photographer and one of the first to excel in the new field of photojournalism. She developed innovative techniques in the emerging field of photography and first became known for her work in industrial photography. Following her early success while based in Cleveland, Ohio, Fortune magazine hired her as its first staff photographer at the age of 25 in 1929. She worked out of her 61st story penthouse studio in the newly opened Chrysler Building in New York City. Some of her early subjects included meatpacking plants, paper mills, watch factories, glass makers and bank buildings. She was the first to photograph the Soviet Union's industrial development, which she documented in her book Eyes on Russia (1931). In addition to her job at Fortune, she also handled advertising accounts including Buick, Goodyear Tires, TWA and Eastern Airlines. The advertising jobs helped to pay the bills for her ever growing staff. In 1934 she earned $35,000 during the midst of the Great Depression. One of the assignments she covered for Fortune took her to the Midwest to document the severe drought. During that assignment she became aware of the depth of the suffering and began to reduce the number of advertising accounts she handled in order to to keep the public informed of the plight of people across this country and around the world. Her most widely known book, You Have Seen Their Faces (1937) tells the story of the South during the Great Depression and was the result of a collaboration with Erskine Caldwell, who later became her second husband. Margaret Bourke-White joined the staff of Life magazine in 1936 as the first female photojournalist and helped to make the photo-essay a popular format. The first issue of Life published November 23, 1936, featured her photograph of the Fort Peck Dam in Montana on its cover. She covered the Louisville flood in 1937 and during that assignment she took the most famous single image of her career. It featured African Americans waiting in an emergency relief line in front of a billboard with a carefree white family in a car. The caption on the billboard celebrated the American way of life. She was the first female war correspondent and the first woman to be allowed to work in combat zones during World War II. Margaret Bourke-White was diagnosed with Parkinson's disease in 1952, which prevented her from furthering her career in photography for the remaining years of her life. 1936 was a very busy year for Margaret Bourke-White as her reputation as an extraordinary photographer grew. Her image of the Fiesta® buffet table was created sometime between late1935 and the magazine's publication date in June1936. She had begun to sever her advertising commitments, while she was stockpiling images for the debut issues of Life, so one can assume that sheer luck played a part in this photograph even existing. Like most of her work for Delineator, the Fiesta® image was most likely taken at the Delineator's studios, rather than her own studio, which had been relocated from the Chrysler Building to 521 Fifth Avenue. Among her personal papers housed at the Special Collections Research Center at the Syracuse University Library is Box 14, which contains papers from the Delineator Editorial Offices spanning 1934-1936. Perhaps details of the A Bride's First Buffet photo shoot are there just waiting to be re-discovered. Discussing advertising photography in her autobiography Portrait of Myself (1963), Margaret Bourke-White stated , “the paramount thing is, is it convincing?” She did a monthly color food page for Delineator during 1934-1936, with great assistance from the Delineator's food stylist Fanny Herrick. Anecdotes about some of those sessions are presented in her autobiography, but sadly the buffet table photo shoot was not included. Most of the food in her photographs was inedible and required lots of patting, molding and manipulation to capture a convincing final image before the quality of the food products deteriorated. Large blazing floodlights were needed to capture enough light for the photography equipment of the time. The use of large fans helped to keep the food cool and to ward off fruit flies. The long exposure times required made it difficult to capture the food at its best. Many of her shots required approximately 90 seconds of exposure for each of three separate color plates. As a result of the technical problems she encountered, she had a custom camera built, which exposed all three plates at once. The large bulky camera was nicknamed the Queen Mary. 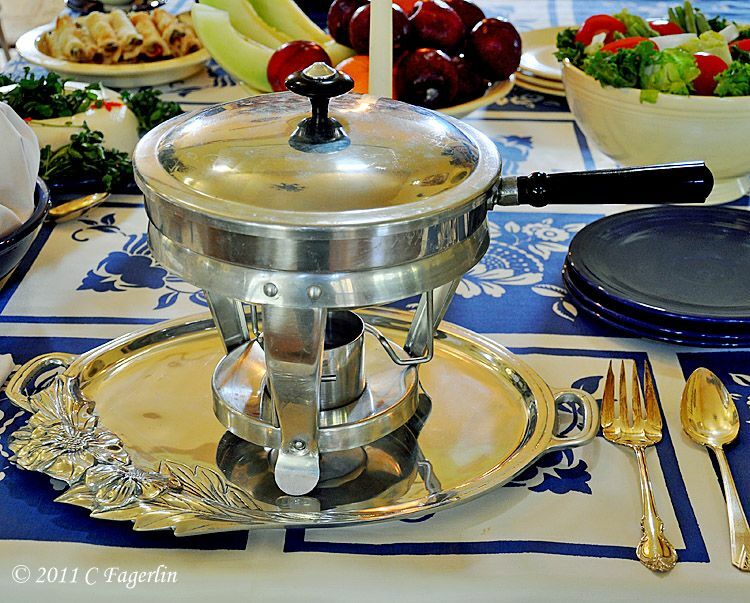 The vintage Fiesta® is easily identified in the image, with the flatware and chafing dish playing only a minor role in the overall image. And then there is the tablecloth. 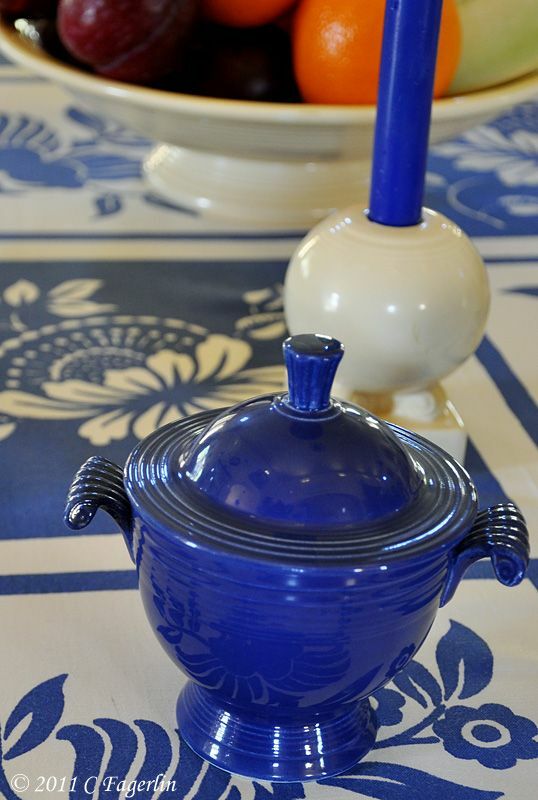 Since the discovery of the image in the Delineator article, there has been a great deal of speculation about this particular tablecloth among both collectors of vintage table linens and vintage Fiesta®. 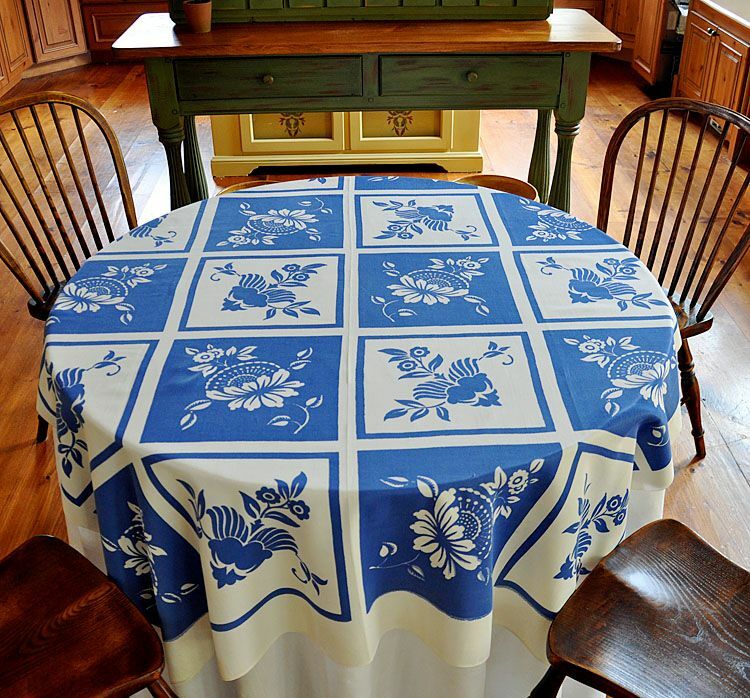 Locating an example of this tablecloth has taken me 15 years. Information about its maker and origin remains undocumented. The tablecloth in my collection could be a knock-off or perhaps it is the original design that was adapted by another maker. 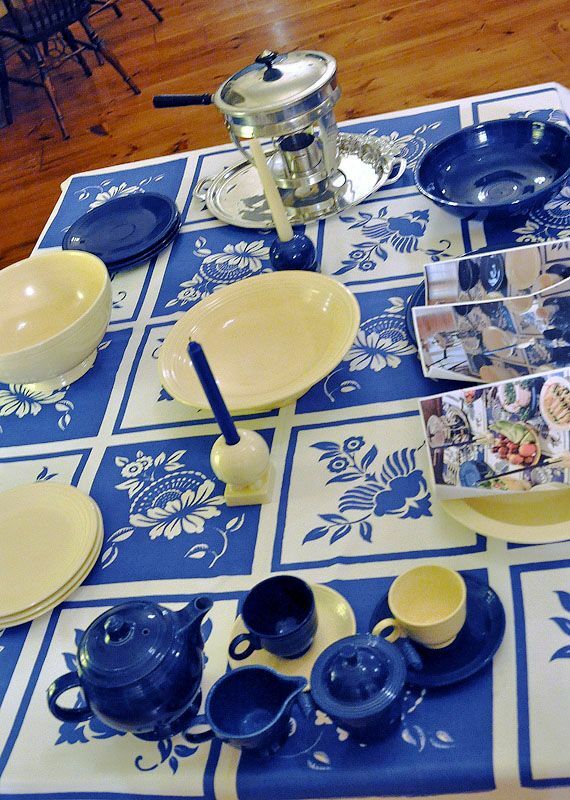 Just as Fiesta® was created using the colorware of other potteries for inspiration, tablecloth makers commonly created their own versions of designs popularized by competing manufacturers. The design is not an exact match for the one in the Delineator. The main difference is the width of the outline border on the white blocks, which are narrow on the printed image, wider on the example in my collection. The tablecloth in Delineator appears to be 6 blocks in length by 4 blocks in width. Mine is 5 blocks long by 4 blocks wide. There are also minor variations in the configuration of the stylized leaves and flowers in the design. As far as the shade of blue, I always envisioned the cloth to be a darker blue than the one I have. Perhaps the blues are different or it may just be the lighting Margaret Bourke-White used for her photograph and/or the effects of time on the paper and inks in Delineator. 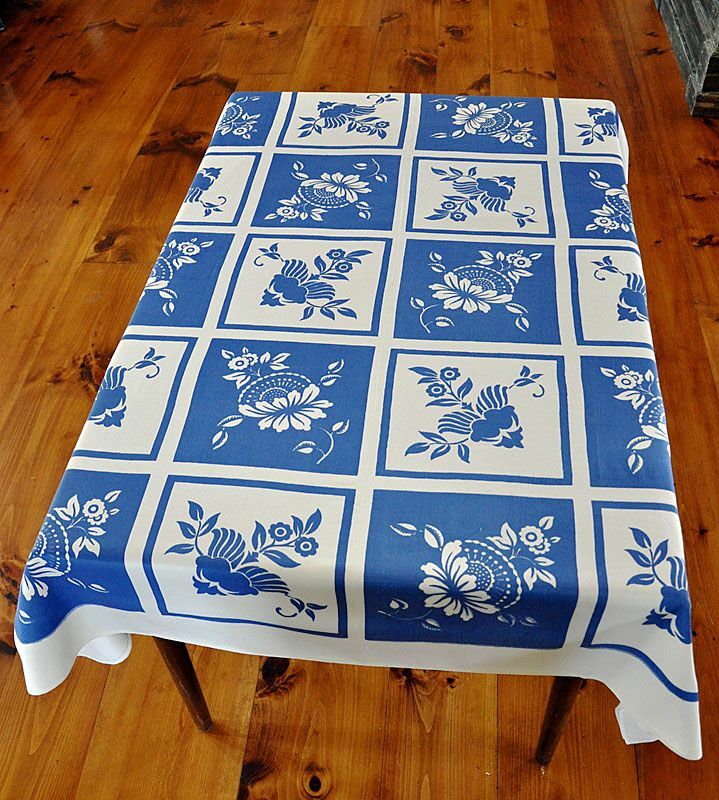 My tablecloth is a high quality medium weight cotton blended with either silk or rayon. It drapes beautifully and the light catches its wonderful sheen. 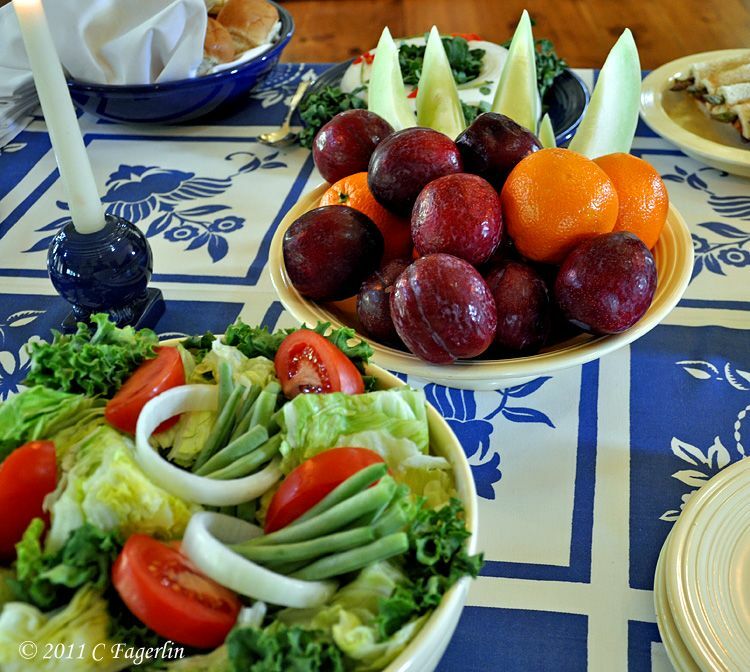 My images are offered as a small tribute to all the talent represented in the creation of the original photograph, the table linens and the dinnerware. 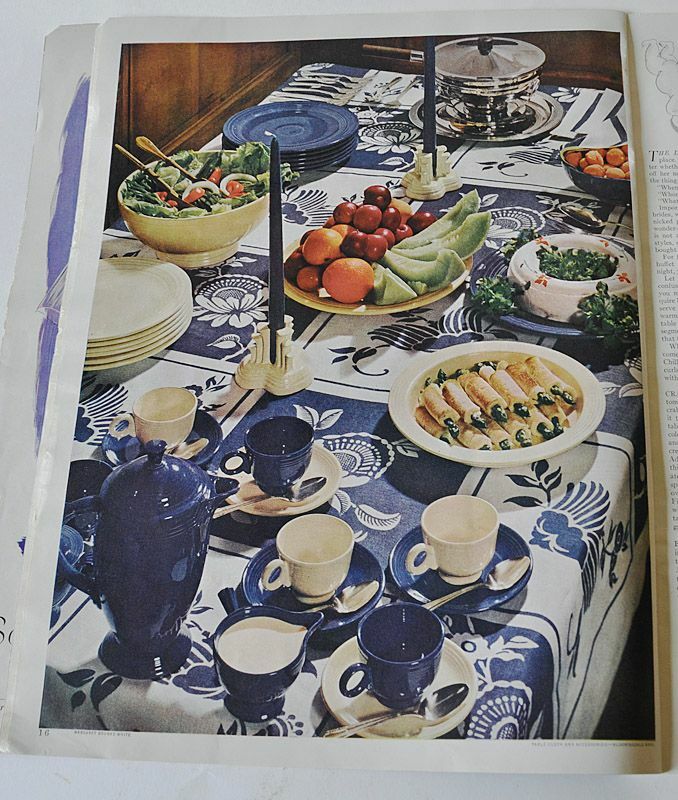 Seemingly effortless entertaining and a pleasing combination of food and tabletop accessories are the subject of popular lifestyle articles in today's publications, just as they were in 1936. 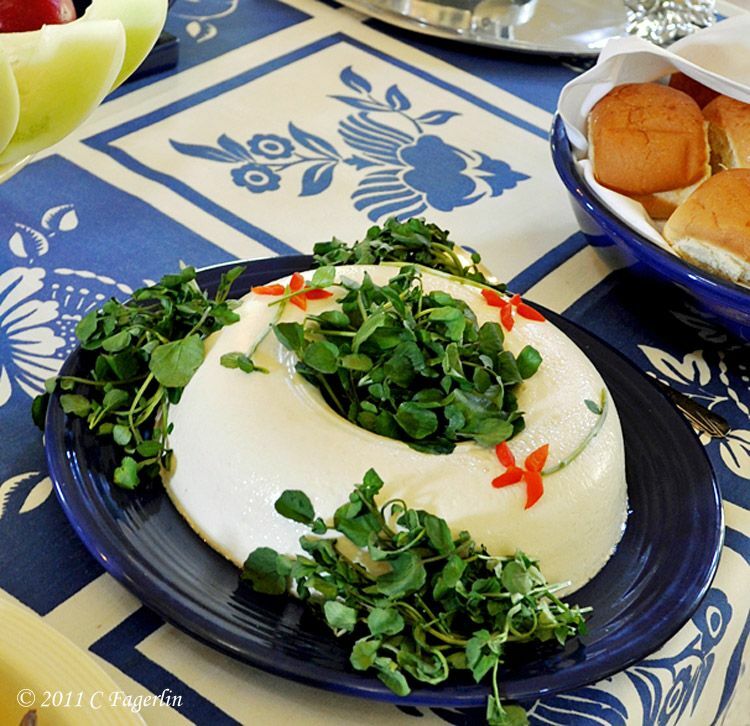 This year marks the 75th Anniversary of Fiesta® and of the Delineator article A Bride's First Buffet. The young bride and groom are older now, but setting the table for a small gathering of friends and family reflects their enduring love for their favorite dinnerware and each other. Please join me in a toast to them, our favorite dishes and to the abundance of talent involved in the creation of iconic dinnerware and a photograph that has stood the test of time. Margaret Bourke-White's image on the left, mine on the right. Back in late February/early March I struggled with getting the lighting right in the depths of our gray California winter. Margaret was always on my mind, as I tried to imagine the struggle she had with her equipment and lighting back in the 30s. Imagine what a photographer with Ms White's talent could have done with today's modern equipment. Playing around with the cloth, dishes and lighting. Should you ever run out of wallpaper paste ..... this would make a good substitute! I'm sure the original would be a lot tastier! And did you know that watercress wilts within about 30 seconds?? I finally started dipping it in ice water to catch it between its fainting spells. 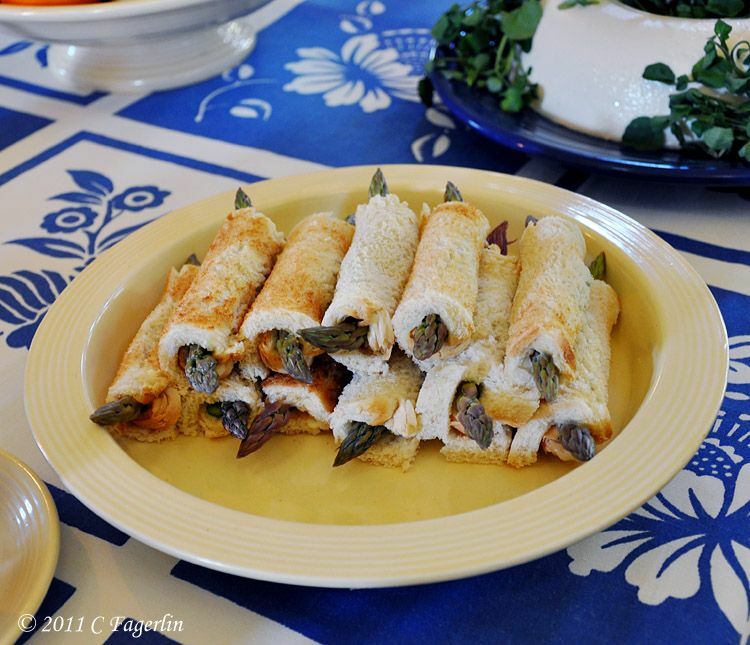 I thought seriously about posting a sign on these asparagus roll-ups, something like DANGER DO NOT EAT! Then I realized there was no chance that anyone in my family would even go near them. White bread, lightly toasted, rolled flat with a rolling pin, slathered in mayo, stuffed with uncooked asparagus. Oh yum! And after a couple of days of posing ..... real poison!! Remember that it was mid-winter? Where do fruit flies come from??? Who knew that fruit flies would congregate just as the "perfect" shot was snapped! For some reason in one of our many moves I disposed of all the chafing dishes I owned, so the one "new" to me item I purchased was this chafing dish. Circa 1950 with bakelite type handles ...... a $17 treasure from eBay. 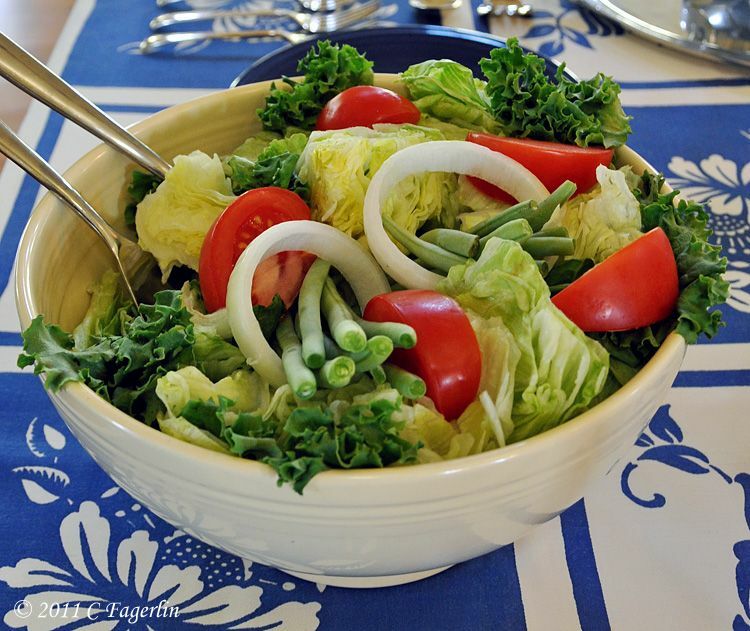 This seriously large salad bowl is hiding a secret. Realizing that it would take about 4 heads of iceberg lettuce to fill it, I chose instead to fill 3/4 of the bowl with that favorite of dish collectors .... bubble-wrap. I cheated and just used plain store-bought dinner rolls rather than make the original tomato based ones from the magazine. 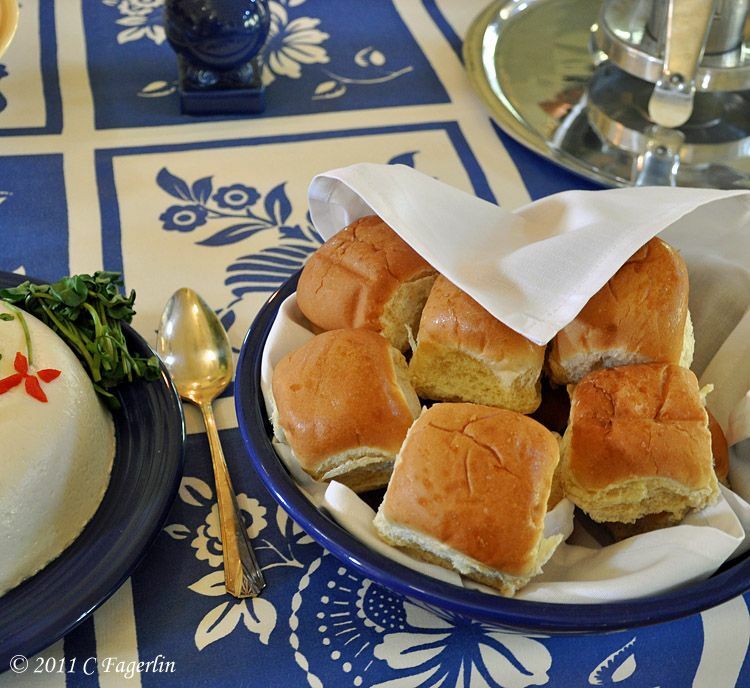 Did you know that dinner rolls that sit out over a two day photo shoot turn into ROCKS? Collectors of Fiesta should be able to easily spot the interloper in these images. instead it is a NOP (not officially produced) Post 86 Sapphire creamer. Please grab a plate and fork and help yourself .... if you dare! Fred Rhead and Margaret Bourke-White for all the inspiration and memories. Alphabe-Thursday at Jenny Matlock for the letter "G"
"G" is for the Great Depression when the dishes, the designer and the photographer all came together. 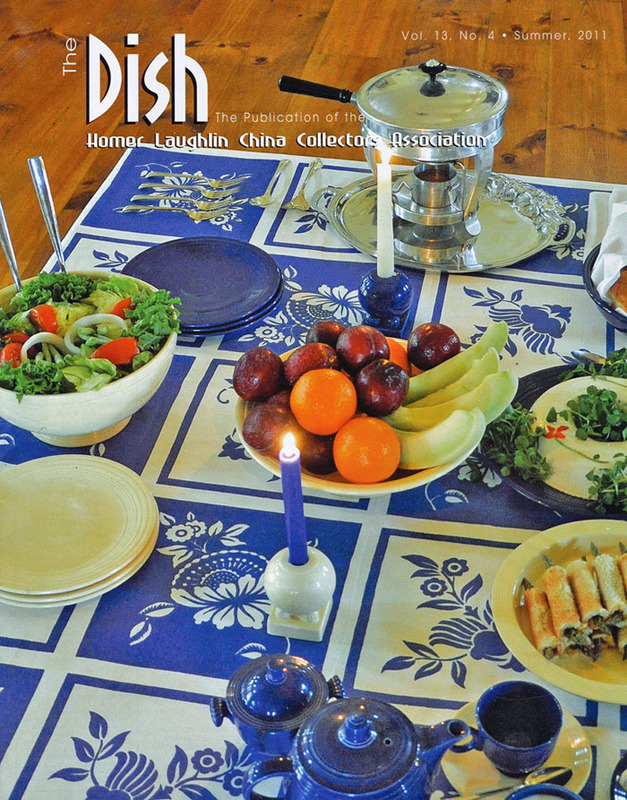 I can't begin to tell you how thrilled I was when I opened the mail, and there was your beautiful cover on The Dish! I enjoyed so much reading the article there, and am so glad you posted here, too. It was especially nice getting to "hear" your comments about how this all came together. Bravo to you for a truly magnificent article and table!!! This was fascinating & wonderful to see how well you matched the original. I kept going back & forth to see how close yours matched. Amazing. Candy, Candy, Candy!!!! I LOVE it!! You're so well informed and such a good writer, photographer and teacher!! I have learned more from you in one year than in my entire life of collecting dishes, linens and pottery. Your table and photo shoot are amazing and I LOVED the article!! What a beautiful and fascinating post! You always amaze me!! I enjoyed reading the process you went through to create this amazing tables cape. Bravo! Wonderfully done reproduction. Your article was very interesting, too; I enjoyed reading about the history behind your tablesetting. This week is my second blog-aversary and I'm hosting a "Where do you keep it all?" party on Sunday. I'd love to have you join me. How very fun! I love your rendition of the picture. Beautiful -- wonderful work! 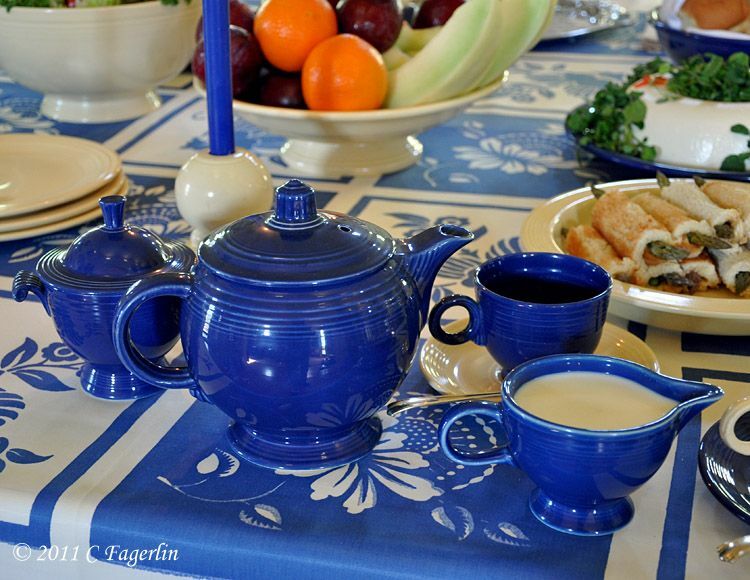 I love, love, love the blue tablecloth. Have a collection of Fiesta but not much blue or white. Wow! Nice recreation you've done. This looks wonderful almost 80 years apart! Congrats on your article. I do not know that magazine but I can see why yours was selected. Beautiful work. Thanks for a quick education on Fiesta ware. Who knew!!! Your table is pretty close to an exact copy of the original and that is amazing! Thanks for linking to Treasure Hunt Thursday. You did an AMAZING job with this table and your narrative was fascinating and informative. THANK YOU!! 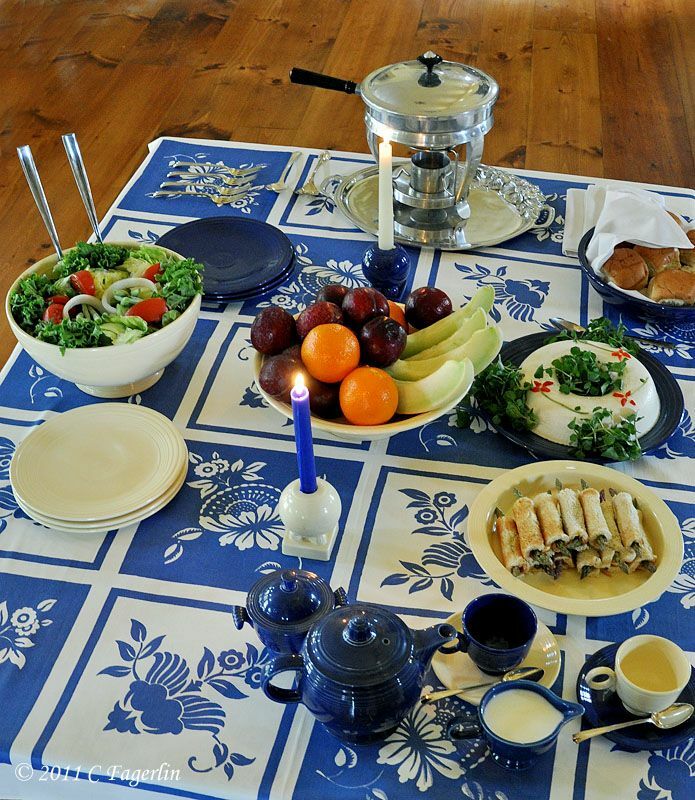 I'm totally floored that you found the exact tablecloth (or a knock-off). I'm also floored that you spent 15 years looking for it! Amazing! Wow! As always, I am truly impressed with your work, Candy! I loved reading about the history and the photographer of the original photo and I absolutely love your recreation of it! Hi Candy!Love vintage mags...articles, ads, still so useful. your repro is wonderful as always. Candy, thank you for this expertly researched and written article. And I really loved your "behind-the-scenes" tour of your own photo experience. The recreation is most impressive, and great fun! 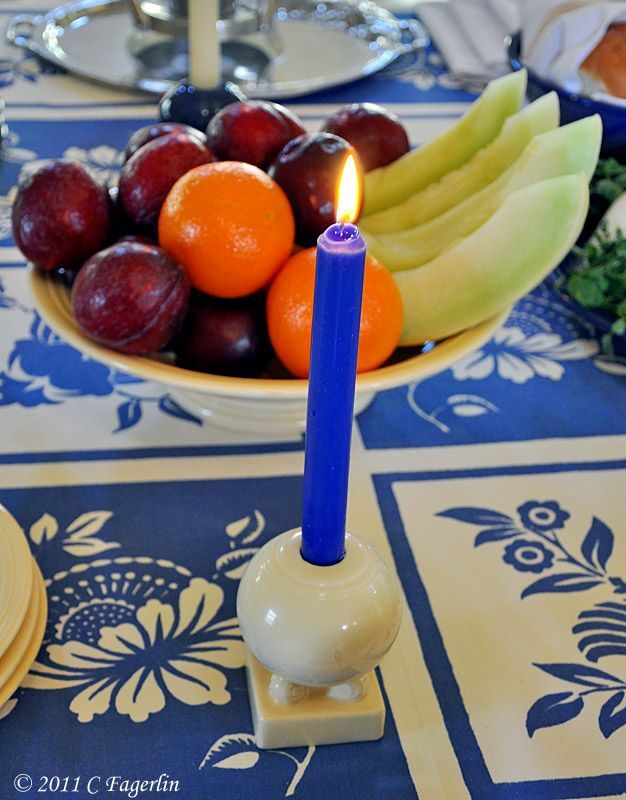 On Tablescape Thursdays, yours is one of my favorite blogs. Well done. Wow! This is all so great! GET OUT! It is AMAZING how you created a twin photograph! Your research is by far superb. 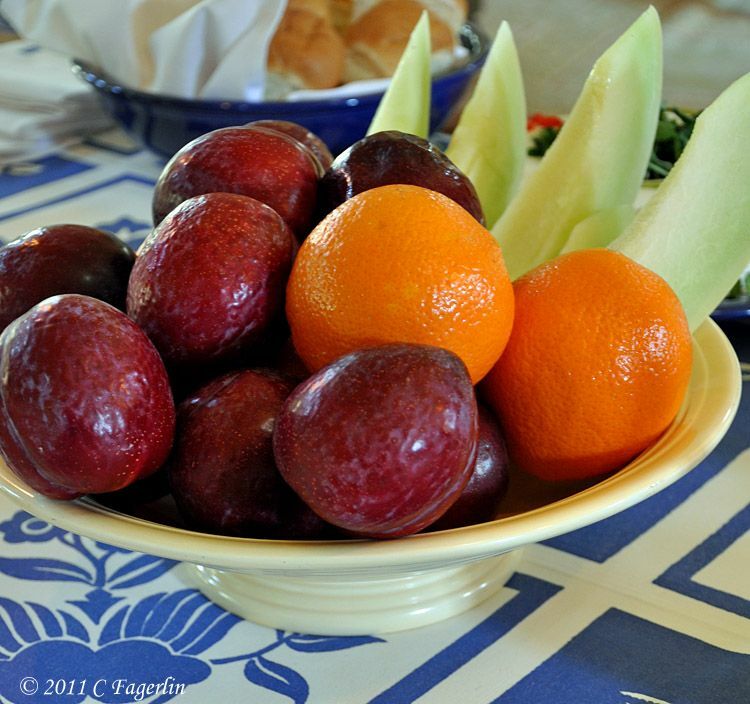 I so enjoy coming your blog because you never disappoint with your wonderful taste, talent and photographs. I feel like I have really been in your home to see all of your wonderful collections. I never pass the Macy's Fiesta placesettings display and not think of Candy's Little Round Table. What a wonderful post in honor of Fiesta's Anniversary! This is fabulous how you recreated the table. You did a wonderful job. Thanks for linking this up to Home Sweet Home! Candy, I had to laugh at your comments about the food! 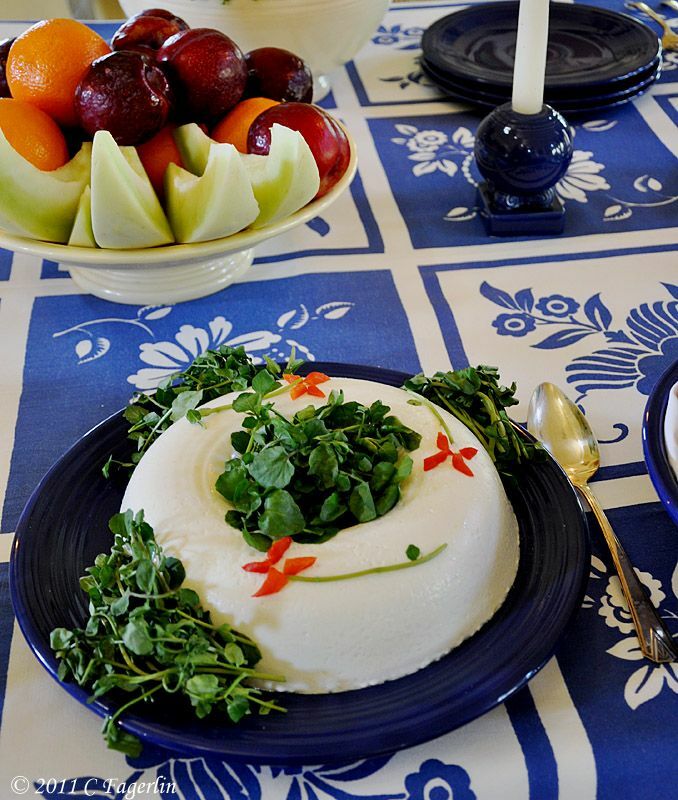 You recreated the Fiesta table beautifully. I can't believe you found such a similar tablecloth. Thanks for joining my party. WOW! I am a fan of Margaret Bourke-White's photos and you have done a remarkable job at reproducing this buffet photo shoot in every way. This was fascinating to read and your attention to detail is outstanding. Thanks so much for such an enjoyable post! A wonderful recreation with beautiful photographs. You're definitely a detail person and I enjoyed studying the photos. I enjoyed the history lesson too since I didn't know a whole lot about Fiestaware. Wonderful article and recreation. 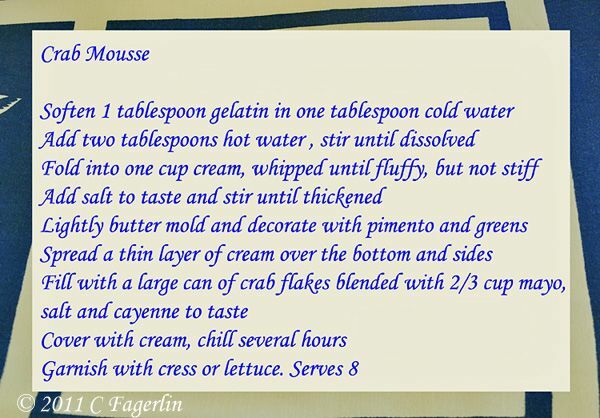 My favorite in The Dish. I'm glad you shared it here also. Wow, just fantastic photos. 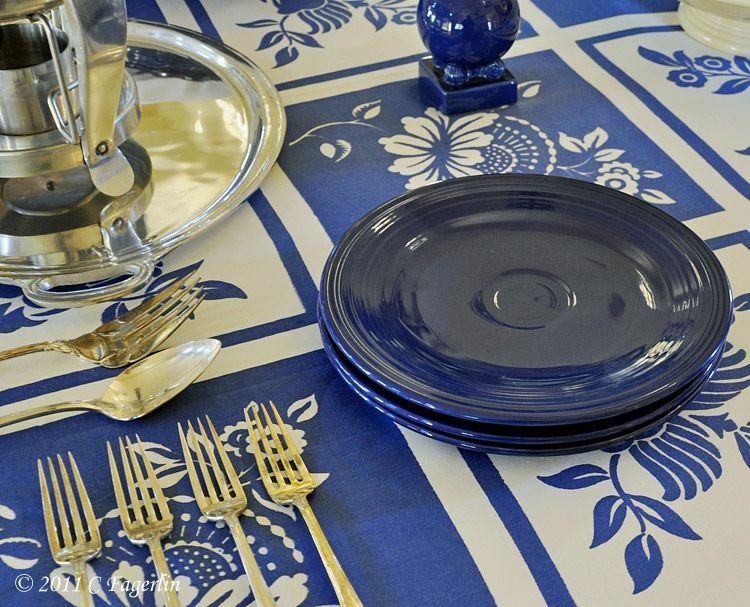 I love, adore, really want that lovely tablecloth! Thanks so much for coming by to help celebrate the elements that went into creating this tribute to the original artists. I appreciate all your comments and visits. This anniversary celebration is wonderful beyond words, Candy! Thanks for a beautiful tribute! 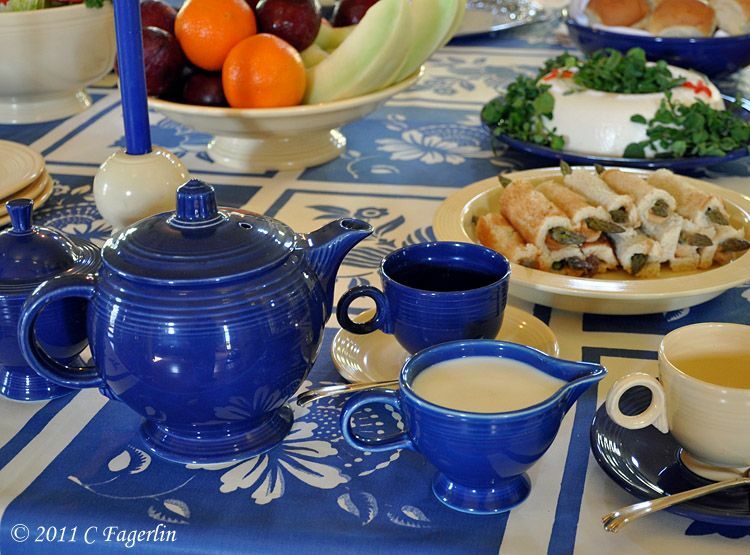 i love vintage cookbooks and magazine recipes and your reproductions of these tablescapes is amazing...what time and attention to detail...and interesting factoids about the original photos...thanks for sharing at fridays unfolded! Very well done, indeed. You put an amazing amount of work into this article. Kudos. I didn't learn about Fiesta ware until the early 90s when my colleague's house was being photographed for a home decor magazine and she brought her collection out. Aha! Now I understand your amazing tablescapes! You are a professional. And an absolutely astonishing one at that! 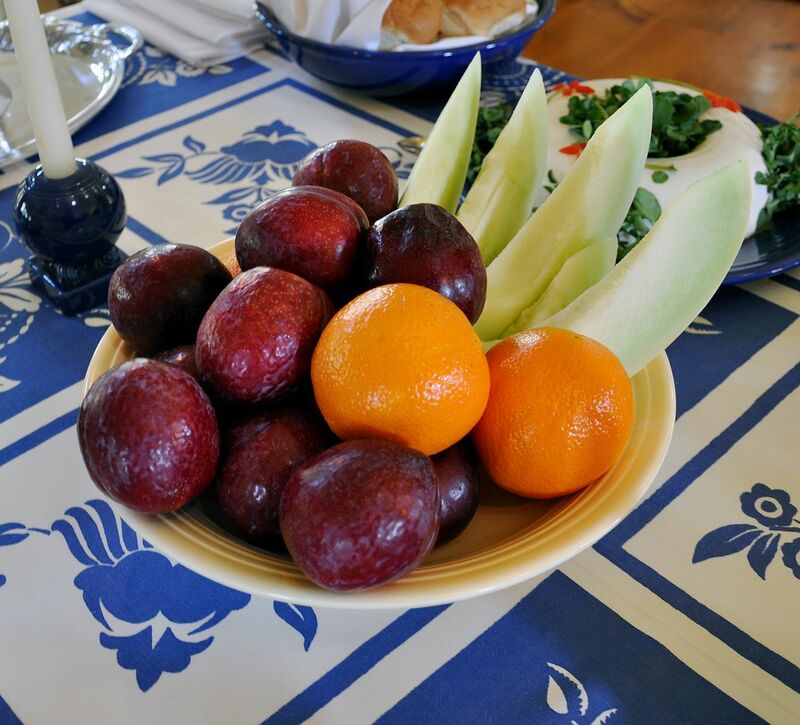 Congratulations on your article and your amazing reinterpration of a classic and timeless table setting. You did a fabulous job on your "tribute" table! Everything looked beautiful. Thanks also for the historical information. I found your post to be a fascinating read. 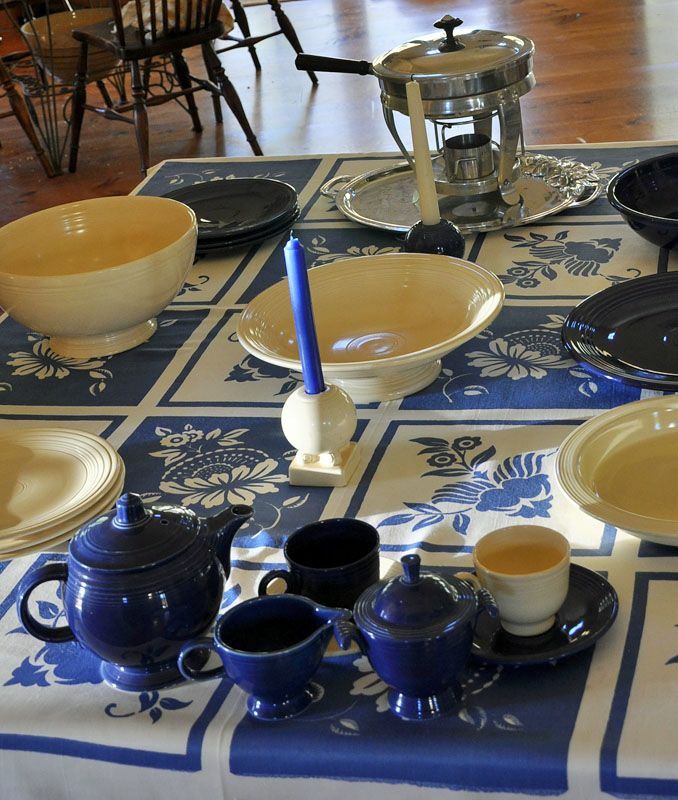 Thank you all so much for coming by to see this special tablescape. I appreciate your generous comments so very much. What a lovely tablescape. And the food? Oh my gosh! Following from my new blog! Thank you all for your sweet comments! I hope you will drop by again sometime soon. What a great tribute Candy! You did a fabulous job recreating Ms. White's buffet! I liked learning the history behind it too. I loved your food quips! Beautiful....from a fellow Fiesta crazy person! Thanks all, it was a fun project and I am so glad that you enjoyed it too. Truly amazing and so educational! Thank you for this perfect recreation! Thanks Rebecca, so glad you enjoyed it! Thanks for coming by Courtney! It was an interesting project to work on, some of my favorite things always make me smile.